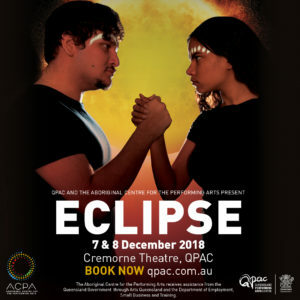 The talent of 30 rising stars will mesmerise audiences when the Aboriginal Centre for the Performing Arts (ACPA) reveals its end-of-year season, Eclipse, at the Queensland Performing Arts Centre’s (QPAC) Cremorne Theatre on 7-8 December 2018. An inspiring journey through music, dance and drama, Eclipse reflects the sensation of change and realignment – what might be obscured, revealed and realised as paths are crossed and perspectives shift in moments of time. ACPA CEO Dr Dimitri Kopanakis said the show, a culmination of the students’ efforts over the year, is a powerful metaphor of the artists’ own creativity. “Just as light emerges from the shadow in an eclipse, our students are expressing their transition from uncertainty and self-doubt to possibility and passion,” Dr Kopanakis said. “These young artists are continuing the cycle of change that began with ACPA’s very first classes in Brisbane two decades ago. “ACPA now welcomes students from all over Australia to study the only nationally accredited courses that incorporate dance, acting and music, including classes dedicated to Indigenous cultural fusion. Mirroring dawn to dusk, ACPA dancers link the two exciting genres of Cultural Fusion and Commercial Jazz. From Day to Night sees the awakening of three tribes through the women’s graceful preparations in the morning and the lively pace of the men’s daily hunt to the powerful energy of Latch and its universal theme of love. ACPA actors explore the meaning of life with excerpts from two challenging classic dramas: Jean-Paul Sartre’s No Exit, a study of the nature of existence through the lens of death; and Harold Pinter’s The Dumb Waiter, which explores the dynamics of power and partnership between men. Eclipse of the Tribes is an original concept created and developed by ACPA musicians. The musical narrative of self-discovery, individuality and common unity connects with tribal roots through conflict and reconciliation. Previous collaborations between QPAC and ACPA include Leah Purcell directing students in Jane Harrison’s Stolen; Wesley Enoch directing Roger Bennet’s Up the Ladder; Stephen Lloyd Helper directing Blak Electric; along with consecutive annual showcase events Knock Knock, Flight and Awakening. QPAC Chief Executive John Kotzas said 2018 marks QPAC’s 12thyear collaborating with ACPA to present new works. “ACPA is one of our most important training and educational institutions providing the space and expertise to prepare the next generation of performing artists and arts workers to achieve their potential,” said Mr Kotzas. “This special performance combines music, drama and dance in new and original works that highlight exceptional homegrown artists.